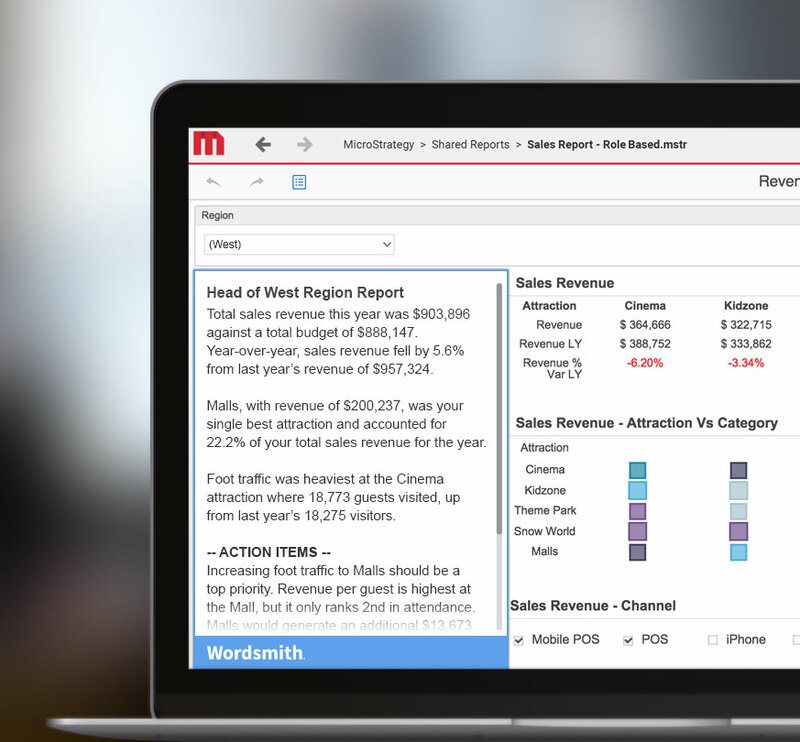 Equip your MicroStrategy dashboards with the power of natural language generation (NLG). It’s the bridge that connects data analysis and exploration with understanding and action. The API integration with Wordsmith lowers the learning curve for business users by guiding them through a visualization with annotations. Furthermore, the integration crafts a narrative that brings together insight from the whole picture of business metrics, instead of creating multiple narratives for each visualization separately. Wordsmith turns your dashboards into a comprehensive analytics environment for each and every user—no matter their role, department, or skill level. Eliminate the risk of data misinterpretation and improve decision making by providing full contextual analysis alongside your dashboards. Wordsmith puts your most skilled analyst in the driver’s seat, allowing you to scale their data expertise across your entire organization. One dataset can yield different KPIs for different people. That’s why Wordsmith generates tailored insights to everyone within your company. NLG is transforming how the enterprise analyzes, communicates, and acts on their data.